← Do Startup Weekends Help Create Startups? Garage48.org guys had another one of their weekend hackathon events, returning to homely Estonia (after Helsinki and before Riga and Stockholm events – check them out) to focus more narrowly on building working apps that address some public service need. There has been some fair coverage already, on the high quality output from the event (see the project list here) and some of the impediments the event revealed about things like government providing access to data freely for all kinds of app developers. (if you speak Estonian make sure to read Teller and Memokraat). Why do I think it is important to visualize something seemingly as boring as a state budget? access to data – frequently checking some spreadsheet files on Ministry of Finance webpages as a pasttime, anyone? just too large numbers – a normal person can freely count money in the scale that they receive monthly on their own bank account, and maybe avoid major mistakes in the range of their annual income. (To argue for anything beyond look at consumer behavior before your average mortage crisis). For too many a million, 100 million or a billion blend together into abstract “a lot of money” that they are not able to grasp pragmatically, let alone have a comparative discussion around. Understanding the dynamics of our budget, keeping it balanced, the relative scale and interconnections between income and expenditure items becomes double important before the elections (such as the ones we are in right now, to close this Sunday). Every party pays top dollar to put forward oversimplified promises in heavy pre-election advertising – but it is very hard for a voter to understand what the real cost (or alternative cost) of “free higher education for everyone”, “4-lane road from Tallinn to Riga”, “higher pensions for mothers” or rather silly “citizen salary for everyone” would be. Taking the above thinking and some recent examples by New York Times Budget Puzzle or The Guardian’s Spending Review or Where Does My Money Go? (really, all worth checking out! ), we were chatting with a few friends about a month ago on how to create something similar in Estonia before the March elections. As a citizen and technologist I am a huge supporter of anything that creates more transparency, better understanding, less populism and ultimately – more educated decisions in democracy. But as usual, everyone in that particular Skype chat though feeling very much the same played the always handy “I’m really busy this week” card and while at it I also added that if someone gets it done I’m happy to put some money in. Though Garage48 events are never about the prospect of pay I was extremely glad that some people (namely Rene Lasseron, Tanel Kärp, Helena Rebane, Konstantin Tretjakov, Martin Grüner, Reigo Kinusar, Hegle Sarapuu, Henri Laupmaa – let me know if I’m missing someone!) came along with the idea and actually made it happen – and I got to keep my promise. 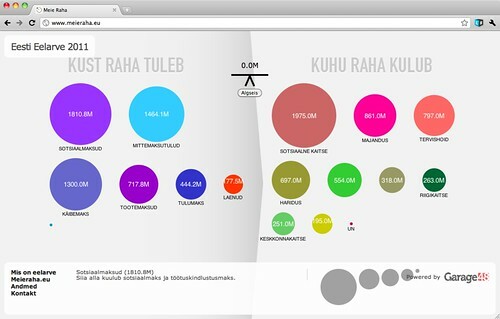 The site today works showing the actual approved 2011 budget for Republic of Estonia. You can fold items apart and together, resize the bubbles to see cross-dependencies, drag in comparison items (those gray bubbles on the bottom) and attempt to push the budget out of balance (the scales in the middle). Yes, there are a bunch of glitches here and there, but hey: what was the last piece of working software you delivered in a weekend? … — please do leave more ideas in the comments! Thanks, Sten, for good overview and describing the potential to go further! Just for the record – the idea was presented to G48 by Hille Hinsberg (Praxis) and there were several consultants in the team – Paul Tammert, Rein Püi and me. I’m personally very interested to develop it further, into a kind of reality game. Sorry for leaving you guys out – updating the post now. Thanks for all the effort this far! I am happy that we finally have the first working beta up – the discussion about it has been there for some time. Thanks Sten and Toomas for supporting the concept.